Gallipolis City Commissioners gathered Tuesday evening to listen to ongoing deliberations regarding the community block development grant. From left to right, sit Commissioners Mike Fulks, Stephen Wallis, Roger Brandeberry and Matt Johnson. Not pictured: Tony Gallagher. 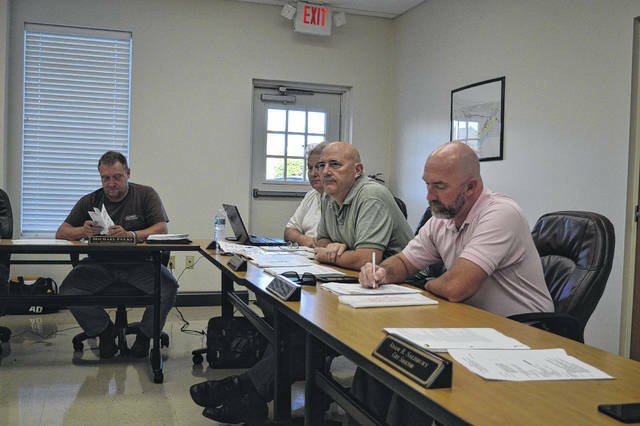 GALLIPOLIS — Gallia County Administrator Karen Sprague attended the Gallipolis City Commission Tuesday evening to discuss ongoing community block development grant procedures to replace a culvert under Airport Road traffic lights replaced in June. Lights replaced included the intersection of Second Avenue and Pine Street, Second Avenue and State Street, Third Avenue and Pine Street and Fourth Avenue and Pine Street. As part of interactions and dealings with American Electric Power to switch to LED lights in a move to save power, the local match was less to apply to the project. The original bid entered by West End Electric Company was around $27,500 while the project was expected to cost $32,500. The CDBG grant is an ongoing annual application procedure and has been used for multiple count projects over the years. The city is still examining the culvert situation on Airport Road and the potential for replacing it as the area has been known to be a flooding problem. Sprague has spoken with the Gallia Engineer Brett Boothe about looking into permit procedures involved with construction and said the state is still in the midst of considering a grant agreement for the city’s proposed culvert replacement project. https://www.mydailytribune.com/wp-content/uploads/sites/42/2017/10/web1_DSC_0741.jpgGallipolis City Commissioners gathered Tuesday evening to listen to ongoing deliberations regarding the community block development grant. From left to right, sit Commissioners Mike Fulks, Stephen Wallis, Roger Brandeberry and Matt Johnson. Not pictured: Tony Gallagher.